Talking about adaptations has got me thinking. How would I go about adapting something for the silicon screen? Instead of choosing something that’s likely to get made, I’m plumping for one of my favourite TV shows, The Wire. The Wire, for those who haven’t seen it, is an attempt to realistically examine Baltimore from the point of view of a number of different groups within the city. It starts as a police procedural, focusing on cops and the drug dealers they are intent on locking up, but it quickly grows to encompass the school system, the political machinations at local and state level, print media and the declining stevedore industry. 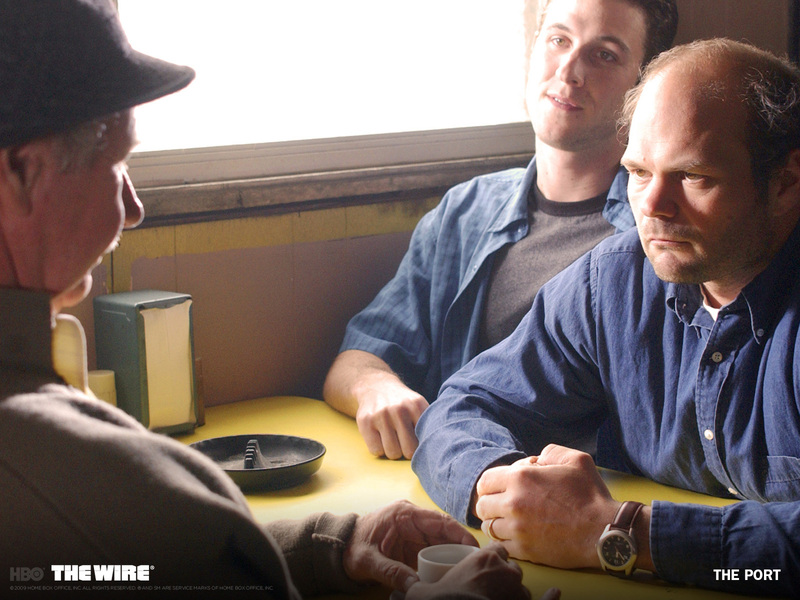 The density of The Wire is intimidating, but it makes for a compelling show if you fall for it. So, what would I do to make this experience into a game of some kind? The easy answer would be to craft a Grand Theft Auto clone with a Baltimore accent. You could choose to be a gang member or cop and work your way up the hierarchy until you were kingpin or commissioner. Throw in a handful of characters from the show, Omar, Bunk and McNulty and you’d have something that looked and sounded like The Wire. It would be shallow compared to the original. One of the joys of the TV show is that it doesn’t really have a single point of view; there are no stars in The Wire. Even if you root for the cops in the first season, it is difficult to say by the end of the fifth that any groups are even altruistic never mind heroic. There are no sides only people caught in a particular part of the system. This layering of interest upon interest is key in giving The Wire its particular feel. With this in mind, we shall begin our first-pass design. The first significant decision is the type of game we want to make. A sandbox game seems the most obvious choice, with various types of mini-games available for the player to choose from. An interelated set of variables could describe aspects of the city dependent on the players actions. These variables would be expressed to the player in the form of crime statistics and reports, newspaper vitriol and polling; essentially a combination of nearly accurate ‘facts’ that players have to base their actions on. Could you make The Wire into something else? A point-and-click adventure for example? It could work as a game, but I doubt that an adventure game has the necessary complexity and depth to be able to represent The Wire experience. A point and click is inherently reactionary and fosters the impression that there is a single way to complete a game, whereas the experience we want to give the players is based on the idea that every action has consequence and is an interaction with the environment. To differentiate this game from the slew of sandbox games out there, the unique feature for The Wire would be the ability to take control of any individual member of the city at any time in the game. Every NPC would act according to a set of behavioural algorithms when not being ‘used’. These behaviours would be modified by the actions of the player and also the other NPC’s. In this way the city would be constantly evolving. Instead of the player being the centre of the game, they could be any number of parts, each one weaving a distinct narrative within the city. I’ve talked before about shifting perspectives in games, I’m not a huge fan when it destroys the flow of a game, so my initial preference was for a fixed third-person view. This seems unrealistic considering the complexity of the game and the types of tasks people are likely to be getting involved in. Rather than fight the issue, and create a problem based on my own personal choice the point of view should shift when players are performing different tasks. This would add, rather than detract, from the gameplay as the differing perspectives would delineate the different tasks effectively, giving the impression that the players are doing something fundamentally different. I like the idea that you could play this game from the point of view of as many or as few people as you like. I think it would be neat if you could play it exactly like Omar or McNulty, as a lone wolf against the city, which would roll around merrily despite your machinations. Equally it would be interesting if you could become any member of the city, at any time. If, for example, you’ve been playing for a while as a cop, but a story in the paper comes up with news of a particular vote by the civic authority you could ignore it or try to influence it with one of the political characters. It would be important to show that ‘winning’ in one area of the game will necessarily lead to ‘losing’ in another. Most obviously this would occur when the police achieve success against the criminal fraternity, but having an effective police force costs a certain amount of money, and that money won’t available for paying teachers or creating jobs. Over a long enough timeline you could see that the inhabitants of the city that you’ve created are unsuitable to become effective police officers as the education system has gone to hell in a hand cart. As much as it would be nice to have a fully scripted, acted and designed plot to hold all this together, I think this would actually diminish the game. If it has a definite story it also has a definite end, which may give the players the impression that that is the final goal of the game. If it is open and not scripted then playing the game becomes the goal of playing the game, and it doesn’t become simply an exercise in unlocking full motion video. Is there a need for character development or is the city the real character? I would argue that the city is the important factor here, but the reason for it’s interest is the behaviour of those within it. Practically though, should the player control how their avatar develops and how? If there isn’t any progression what would be the point of using one NPC over another? Logically you’d just go to the most useful NPC at the time, but if you can alter them you can make sure the one you’re using is the best fit for the type of game you want to play. This would have the added benefit of creating a bond between NPC and player. How do we deal with player death? To make it effective, there should be no lives or save points. Dead is dead and there ain’t no coming back. To be clear, this won’t be a game over situation, but it will mean that that character will be over. Why do this? In The Wire, there are very real consequences for characters actions and many people die, are incarcerated, get fired or move in and out of the story for various other reasons. When they go, it means something because of the emotional investment we have in the characters. If you spend time investing in a computer game character, with meaningful progression, then character death will be a meaningful event. In the TV show, the main group that is regularly put in mortal peril are the drug dealers at street level, but there are times when other characters are exposed to danger on stakeouts and sting operations. The sense of tension here should be higher as the costs of losing a police officer should be higher. This is because they should be harder to replace and retrain and there would be other penalties for the department as a whole such as increased political pressure and another investigation to run into the death (those stats don’t go down by themselves you know). Each citizen would have a number of internal characteristics – Courage, Loyalty, Altruism, Greed, Aggression, Intelligence, for example, that determine their Archetype. An Archetype would determine the behaviour of the citizen. Changing the aggression characteristic might result in the individual falling out of a gang archetype into a different, less violent criminal archetype, like a Burglar. Changing archetypes might not necessarily be totally dependent on the characteristics of the individual. A character that wants to become a cop may not be able to because there aren’t cop jobs available, either they remain what they were, whatever that was, or if they have a high enough courage they could become a vigilante. If there are multiple archetypes the individual were to be able to fit into, they could randomly be assigned one or they could take behavioural cues from all of them. If a particular part of town is made up of lots of greedy, aggressive folks with a disregard for authority, you can expect that they would form a relationship with each other. Based on the individuals Intelligence and Courage they could either turn out to be criminals or just ordinary members of the public. There would be a number of archetypes that correspond to various characteristic sets, so that NPC’s behaviour can be modelled more easily than determining behaviour on the fly. In the example above, the sort of criminal most likely to result from the agressive, greedy, anti-authority types would probably be drug gang members, who would follow behavioural patterns laid down in their archetype. The relationships the NPCs are in will determine the type of behaviour they exhibit. For instance, gang members may mug people, but they wouldn’t mug members of their own gang. Being with other people with the same characteristics as you will tend to reinforce those characteristics whereas being in an area with people who have different characteristics will diminish them. For example, being in a police station will diminish the aggression of any visitors. I think this is enough to be going on with, for the moment. I don’t know what is technically possible, But, after playing the dizzyingly complex Hearts of Iron III, for example, this seems positively stunted in ambition. Any thoughts?